The Wachowski siblings Andy and Lana (formerly Larry) have made a name for themselves as directors, screenwriters, and producers (usually all three when creating a feature film). While the 1996’s film Bound was their directorial debut, it wasn’t until their sophomore movie The Matrix came out in 1999 and catapulted the duo towards notoriety and success. Commercially, The Matrix proved to be a juggernaut of movie that spawned two sequels (The Matrix: Reload and The Matrix Revolutions) and a direct-to-video animated anthology (The Animatrix). Following the acclaim they received from The Matrix franchise, the Wachowskis went on to create additional films including V for Vendetta, Speed Racer, and Cloud Atlas, which were met with mixed reviews and produced mediocre results at the box office. 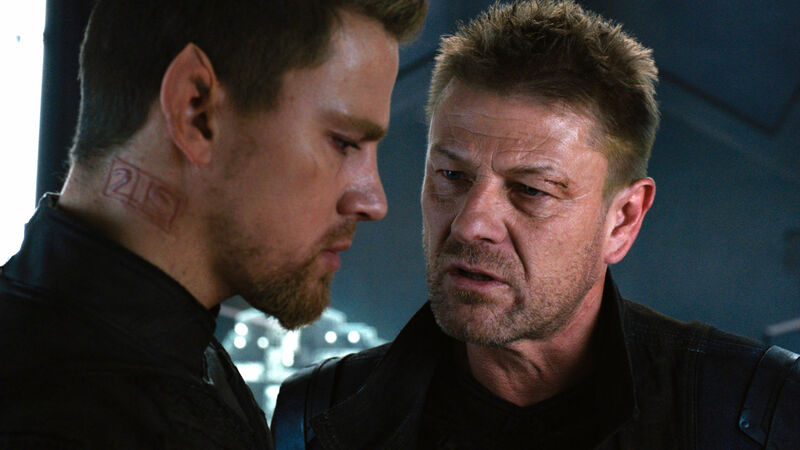 Now the Wachowskis are back, teaming up with Warner Bros. Studios for the sci-fi epic Jupiter Ascending. With anticipation building for a film that’s been delayed for more than a half of year, does this space adventure rekindle the Wachowskis’s success or does it get lost in space? Born into a Russian immigrant family, Jupiter Jones (Mila Kunis) desires something more out of her life, hopelessly trapped in the mundane world of poverty of cleaning houses with her mother and siblings. Her dismal existence on Earth is suddenly shattered when Caine Wise (Channing Tatum), a genetically spliced ex-military hunter, burst into her life, assigned to protect her from aliens and intergalactic bounty hunters on Earth. Jupiter is then whisked away into outer space, introducing her to the cosmos she never knew existed and presented with a new life as a reincarnated heir to intergalactic royalty (The Abrasax family). This, of course, draws ire from the three current heir apparent siblings, Balem (Eddie Redmayne), Titus (Douglas Booth), and Kalique (Tuppence Middleton); challenging Jupiter’s claim as each of the three seeks to claim ownership of Earth for themselves and the paramount essence of humanity. Confronted with a rudimentary understanding of her new cosmic reality, Jupiter places her trust in Caine as she ascends her regal title, while facing off against political manipulations, shadowy proposals, and threats of death. .
As I mentioned above, the Wachowski siblings have endured a bumpy road since the completion of The Matrix franchise. While V for Vendetta was capable in generating positive reviews from fans and critics, Speed Racer was deemed too quirky and childish compared to their previous works and Cloud Atlas was too convoluted for audiences to fully enjoy. The Wachowskis needed a film to bounce back, delving back into their creative engines in crafting a feature film with alluring visuals and a captivating narrative. Jupiter Ascending represents that redemption, answering the call with a more direct approach in recapturing The Matrix’s cinema magic, while borrowing influences from Star Wars, Dune, and philosophical ideals. To its credit, it sort of does with a fascinating outer space feast for the eyes, but muddles its cosmic story with pacing and sci-fi convention predictably. The Wachowskis chart a course to the stars in Jupiter Ascending, traveling off-world to visit alien planets and encountering imaginative creatures, both friendly and hostile. While the movie has the making of a classic space opera, its narrative undertaking is where the movie flatters. The first problem comes from its plots, which has to meander its way through several minor sub-plots (that are either non-essential or don’t complete pan out). At times, Jupiter’s plot is little convoluted. Sure it has the grandeur of a big sci-fi adventure, but lacks guidance and perhaps a proper understanding for viewers to completely comprehend. Several scenes are constructed for exposition to help explain this outer space realm, but names of places, people, terminology, and back-stories are mostly quickly discussed in rapid fire succession that will probably leave some scratching their heads over. Pacing is another problem for film as the narration becomes odd at times with (especially towards the film’s second act) and even playing the conventional standard of a damsel-in-distress scenario (twice!) for both endings of the second and third act. 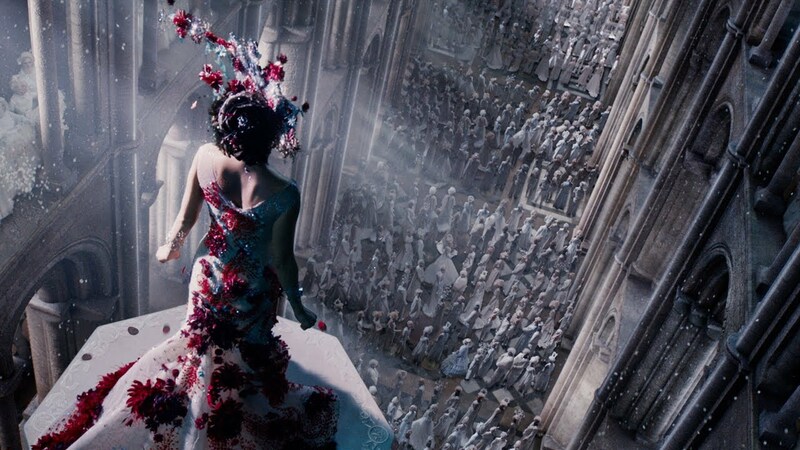 Perhaps Jupiter Ascending should’ve been written as a novel or even a video game, allowing its narrative to breathe and fully examine its intended political bureaucracy and expanded alien worlds. The film, unfortunately, having a running time of 125 minutes long, is placed under time constraints as viewers are never allowed to completely explore the far reaches of space in this imaginative setting. While the narrative is punctuated with numerous problems, the film’s technical achievements are top-notch. The Wachowskis’s world building in Jupiter Ascending is notable and impressive with a great sense of time and care in bringing this universe to life. Drawing inspiration from folklore, science, and religion, this outer space realm feels both plausible and mythical at the same time. The art direction for the film must also be noted with vistas and locales on various planets and spaceships that are detailed with creativeness and imagination. Even the costume designs are intricate lacked together and are amazing to look at. The visual effects, which delayed the movie from being release in summer of 2014, are definitely eye-catching and beautiful to behold, highlighting numerous cosmic sceneries or intergalactic aerial fights. Caine’s anti-gravity boots are one such visual achievement with Tatum’s character gliding and skating through the air with fluent grace. From just a visual standpoint, Jupiter Ascending is truly and quite literally out of this world. Basically, Mila Kunis’s character of Jupiter is our link to this interstellar conflict and does a good job in playing that role. Kunis, a very likeable actress, has the balance of the starry eyed dreamer / naiveté and rightful determination in the movie, but is slightly out of her depth in this big blockbuster feature. Channing Tatum, on the other hand, seems much more comfortable in his role as the brooding and fearless Caine, channeling the right amount of frenetic energy for action oriented scenes and dramatic poise when called upon. While both Kunis and Tatum, more or less, get their respective character down, their romantic chemistry is not organic. Sure, both actress and actor are strikingly good looking and do seem to be having a good time filming alongside each other, it’s just that their chemistry is clunky; more forced than natural. As supporting the cast goes, Sean Bean is always a reliable actor and does a good job in his role Stinger, an ex-military hunter and former partner to Caine. 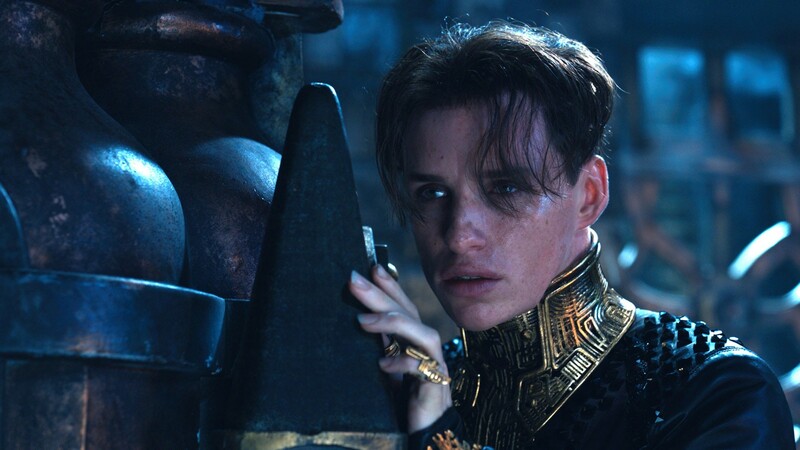 The polar opposite to that is in the villainous character of Balem Abrasax played by Eddie Redmayne. Redmayne, who is now well-known for his award-winning role in The Theory of Everything, plays Balem over-the-top and fails to come off as a titular threat for this expansive space epic. His sibling co-stars, however, fare much better with their roles, committed to their nuances and personas as Titus and Kalique Abrasax, played by Douglas Booth and Tuppence Middleton. Rounding out the cast are several individuals who some might recognize from other film / TV projects, saying “Isn’t that so and so from (insert title name here)”. The Wachowskis’s Jupiter Ascending aims for the stars, but never quite reaches its intended destination. Their sci-fi vision is clear and the amazing effort to create the film’s visual universe, both in front and behind the camera, is highly commendable, but its story never truly falls into place correctly. I personally felt it was good, but not great, but still kept my interest invested in watching the movie. In short, Jupiter Ascending has all the visual fanfare elements of a good sci-fi romp (space ships, bounty hunters, aliens, futuristic worlds, etc), but its story, in the end, lacks the time and precision needed for this incredible amount of detail to be fully explained (along with several other reasons) that ultimately (depending on the viewer) may lose sight of those things that make it interesting or appealing in the first place.